Food value chains consist of food producers, processors, third-party certifiers, distributors, and retailers working together to maximize the social and financial return on investment for all participants in the supply chain, including consumers. 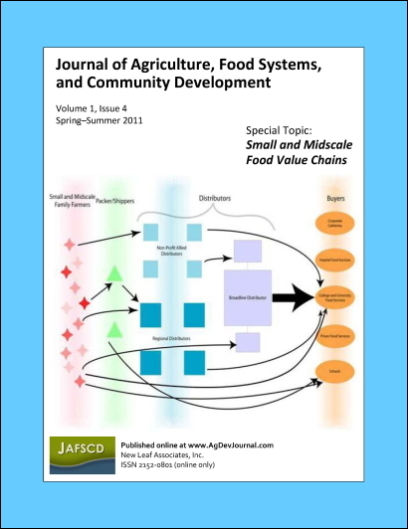 This paper presents a case study of Corbin Hill Road Farm Share, a newly created hybrid food value chain that engages nonprofit strategic partners to provide locally grown and affordable produce to low-income residents of New York City's South Bronx while also enabling Farm Share members to become equity owners of the farm over time. The case study shows that the involvement of community-based nonprofits is key to creating a food production and distribution system that engages a wide range of stakeholders, fosters shared governance and transparency, empowers consumers, and benefits regional farmers. Nevin Cohen, Assistant Professor, The New School, 72 Fifth Avenue, Room 518, New York, NY 10011 USA. Dennis Derryck, Professor of Professional Practice, The New School, 72 Fifth Avenue, Room 607, New York, NY 10011 USA.